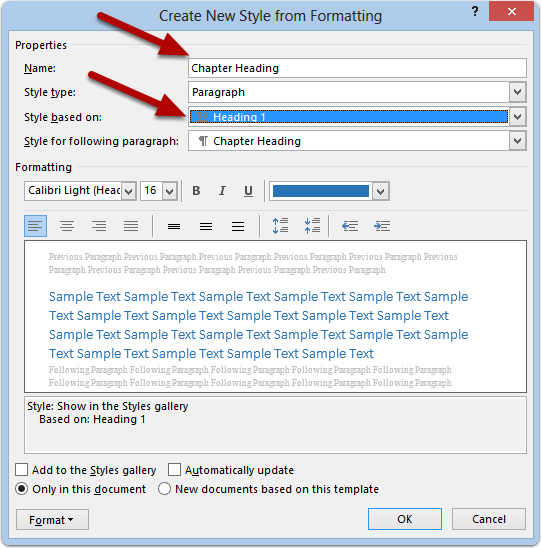 When Clarify generates a DOCX file it assigns certain styles to the content. 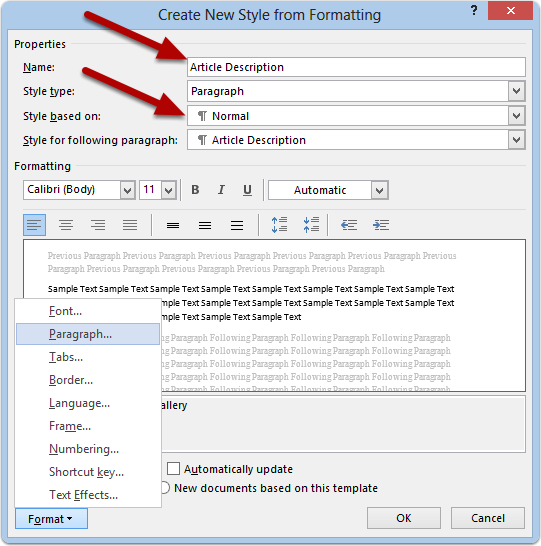 You will need to add these styles to your DOCX template in order for the content to look correct. Note that some of the styles listed are only applicable to ScreenSteps and not Clarify. These styles are listed so that you can add them in case you ever want to use the template with ScreenSteps. 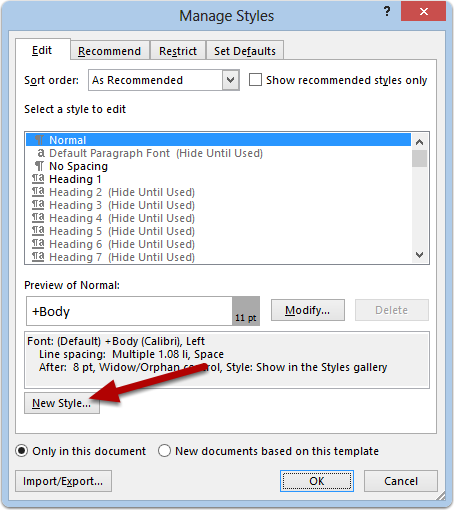 You will need to add the following styles to your document. Article Description: Styles article descriptions. Article Heading: Styles article titles. Step Heading: Styles step titles. Substep Heading: Styles sub-step titles. Step Instructions: Styles step text. ScreenSteps Code: Styles code blocks in step text. 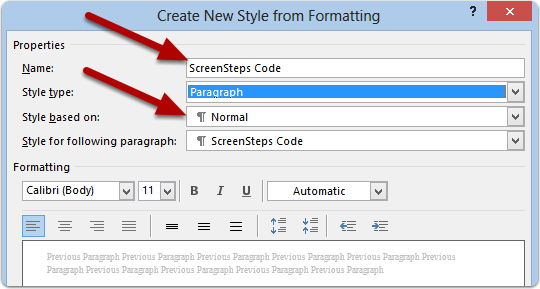 ScreenSteps Code Run: Styles instances of code within paragraph text. ScreenSteps List Number, ScreenSteps List Number 2, ScreenSteps List Number 3, ...: Styles numbered lists. Create as many entries as levels of nesting your documents may have. The templates included with Clarify go up to ScreenSteps List Number 5. ScreenSteps List Bullet, ScreenSteps List Bullet 2, ScreenSteps List Bullet 3, ...: Styles bullet lists. Create as many entries as levels of nesting your documents may have. The templates included with Clarify go up to ScreenSteps List Bullet 5. Step Image: Styles step images. From the Home tab click on the arrow next to Styles. From the Manage Styles window you can add the styles you need to by clicking on New Style. 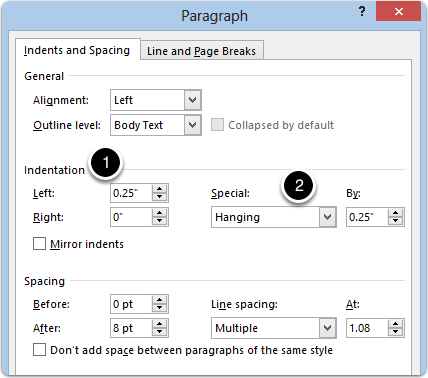 For the heading styles you can base them off of existing heading styles that come with Word. If you are creating a manual template then base Chapter Heading on Heading 1, Article Heading on Heading 2, etc. If you are creating an article template then you can base Article Heading on Heading 1, Step Heading on Heading 2, etc. Article Description and Step Instructions can be based off of the Normal style. 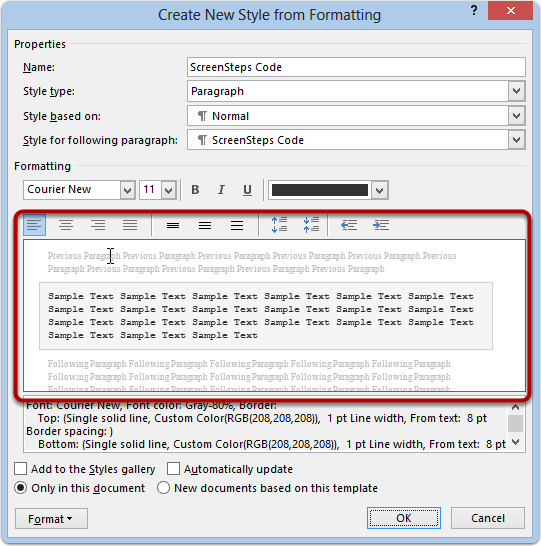 If you want to make any changes to how the text appears then use the Format menu to change text and paragraph properties. The ScreenSteps Code style is used to format code blocks and is based on the Normal style. Font: Courier New, color set to 51,51,51. Border: Box with a solid line set to 1 pt thick with color set to 208,208,208. The border padding is set to 8 pt on top, left, bottom, and right. The shading is set to 245,245,245. This provides the background color. 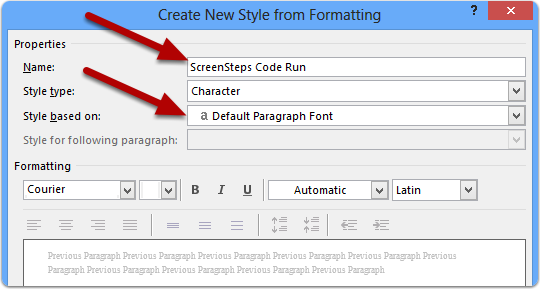 The ScreenSteps Code Run style is used to format instances of code within a paragraph and is a Character type based on the Default Paragraph Font style. Font: Courier New, color set to 187,0,0. Border: Go to the Shading tab and set the Fill to 224,224,224. The Step Image style can be based off of Normal. Use this style to add padding around the image. 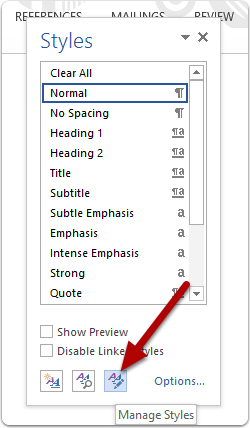 For example, you might set the Space Before and Space After in the paragraph settings to 18pt. 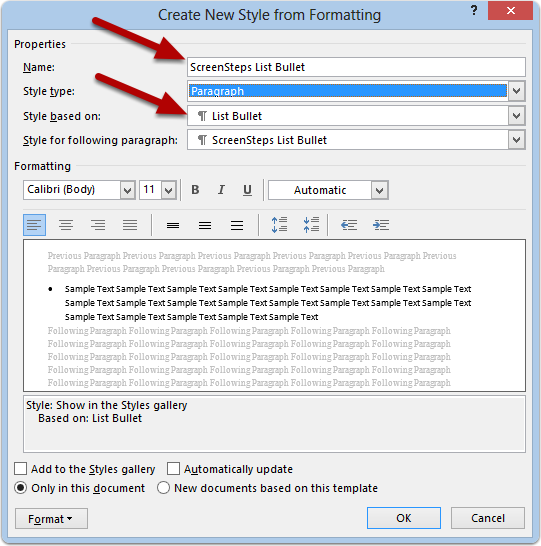 The ScreenSteps List Bullet styles can be based on the List Bullet styles included with Word. Word defines all the way up to List Bullet 5. The ScreenSteps List Number styles need to be created by hand and based on Normal. DO NOT base them on List Number. You will need to specify the tab and numbering settings. 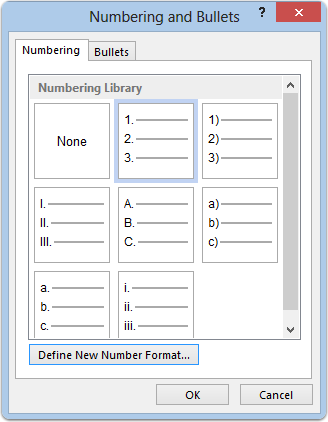 Here are some example settings for list numbers. 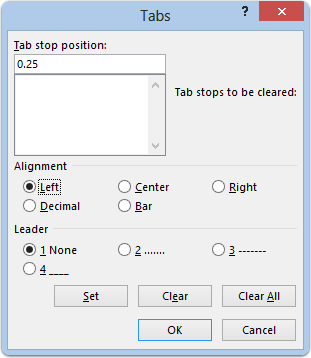 For the Format > Tab settings you can start at 0.25" for level 1 and then move up in 0.25". In the Paragraph settings set the Left indentation to 0.25". Set Special to Hanging by 0.25". Select a numbered list format for your lists. Prev: How is a DOCX template structured? Where do I put custom DOCX templates? How is a DOCX template structured?